Lake Maninjau is a volcanic lake that is located at 461,50 meters above the sea level. Its width is 99, 5 km2 with 4, 95 meters of the maximum depth. The existence of Lake Maninjau has created a folktale called “Bujang Sembilan” (The nine bachelors). People living around the lake believe that those nine bachelors are real. Once upon a time, there was a family consists of nine bachelors and a beautiful girl named Sani. There was a man named Sagiran who loved her, they love each other until one day they were accused of doing contemptible thing by the bachelors. In order to prove the bachelors‘ assumption, both Sani and Sagiran jumped into the cauldron of Mount Tinjau. Before jumping into the cauldron, they swore that the mount would not explode if they did that contemptible thing, otherwise, the mount would explode if they did not do it. Finally, there was a huge explosion causing a big hole that was fulfilled by water that is believed as the cause of the existence of Lake Maninjau. The first President of Indonesia, Mr. Ir. Soekarno, had ever visited Lake Maninjau, as an expression of his amazement, he wrote a pantun (Malayan Quatrain) sounded “Jika makan aria pinang, makanlah dengan sirih yang hijau, jangan datang ke ranah Minang, jika belum mampir ke Maninjau” which means that he suggested everyone visiting West Sumatera must visit Lake Maninjau because of its wonderful scenery. We may compare it with other famous lakes from all over the world such as lake in Luzern, Zurich, and Switzerland. Lake Maninjau has shinny turquoise water with the flapping leaves of coconut trees and hills around the lake that make a wonderful view in Lake Maninjau. 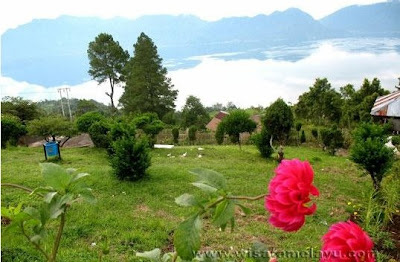 It is located in Tanjung Raya, in the district of Agam, West Sumatra province, Indonesia. Many types of hotels or home stays can be easily found there. There are many restaurants offering delicious cuisines.